The prom season is upon us and so many of our younger generation females are out dress shopping and Pinterest pinning their ideas for everything from accessories to shoes to hairstyles. Specifically hairstyles. While some may opt for more of a boho style, others will go all out with elaborate braided updos, making them look years ahead of their current age. That is not to say that we do not want our little ladies looking all grown up, but perhaps that could be done while still keeping the spring in the step and the light in the eyes, the way braids have a tendency to do. 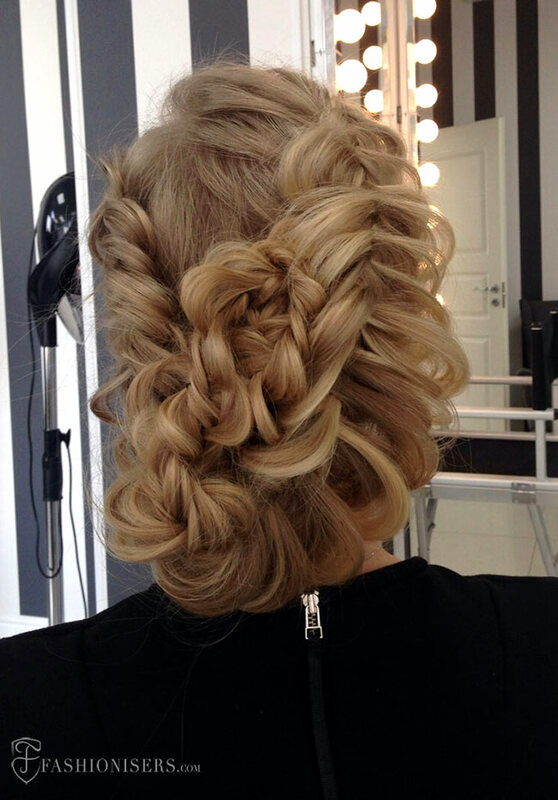 There are so many different types of braided hairstyles for prom though, over 50 easily counted by an individual. A braid is normally also referred to as a plait and is essentially the complex structure of interlacing three or more strands of hair, usually long and narrow, each strand overlapping the other in a zigzag pattern. People have been braiding their hair for over 30,000 years it seems as a figure known as the Woman of Willendorf was found wearing her hair in such a way; Egyptians have also been known to have worn their hair in plaits. A braid was also known to represent the social status of an individual, to show whether they were married or single, in mourning or had reached the age of courtship. Certain tribes and cultures had certain ways of styling their braids, while it was also a way for individuals to socialize, talking as they braided one another’s locks. To this day, the elder generations braid the hair of the youth, who then in turn begin to learn how to do it themselves, meaning that they will carry on the tradition with their own children. But coming back to the topic of your prom hairdos, we have to state that perhaps you should opt for one of these 5 braided hairstyles to really add a bit of magic to your night. After all, it is only one of the most important days (you think so at least) of your teenage years. As you get older, chances are you are going to forget all about prom night, or it will be just a hazy moment that doesn’t even begin to compare with all that will be coming in your later years. We have to ask, which of these appeals to you most? This is the first in the series and not only sounds awesome, but looks positively ravishing as well. The plaiting comes in from both sides, thicker and looser on one, while more refined on the other, meets and coils into an updo that seems to be tilted to one side. The tendrils lowest at the nape make for wide rings in the braid, though not quite wide enough to see through. It is artfully done, a gorgeous masterpiece that has a romantic element to it while still showing off your personal qualities, which means that what makes you perfect is your own imperfections. 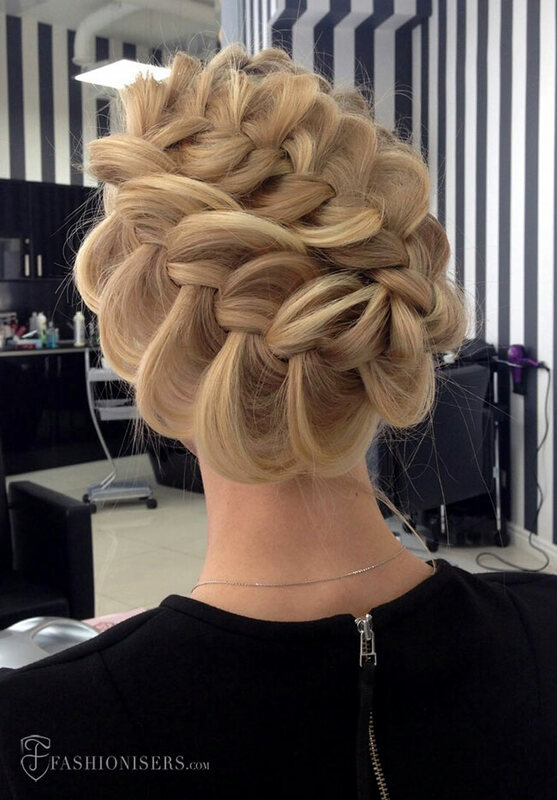 The same way, this updo is perfect because of its almost messy look lending to it an alluring look. This updo has all the elements of sophistication, possibly the modern version of what would have been considered a society lady’s plait about a hundred years ago. There are two large plaits that coil around the head and make for unevenly but geometrically distributed lines, the one on the furthest left being thicker and fatter with looser rings than the one by its side, both utilizing a simple 3 strand style while ensuring they are flattened against the head and that every last inch of it is perfectly proportioned. This way you can look like the belle of the ball, the Cinderella off to dance with her prince. 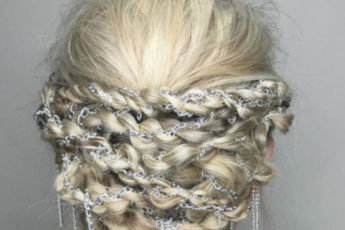 Just make sure you are wearing something with a zipper or buttons as you don’t want to be touching this ‘do for fear of pulling a ring out of place and messing up the perfection of it all. Every young lady wants to look like a princess or an angle. If you can look like both at once, then you have hit the jackpot for sure! That is how it appears to be when you try on the halo braid, particularly when it is done by a master of the art of plaiting. For the best results, you have it start off thinner and quickly move to make the braid fat and flat as it passes over the left side of the head, thinning it out again ever so slowly as you pass under the nape and over to the right side, before thinning it out even more, but not completely as you move back to the top where you started, tucking the ends underneath. Work with the amount of hair you have and give it the gorgeous halo look thus, bringing the angelic fabulous into your prom night. Well, this is not really a ponytail per se, but the way it falls down the right side of the body is rather captivating. 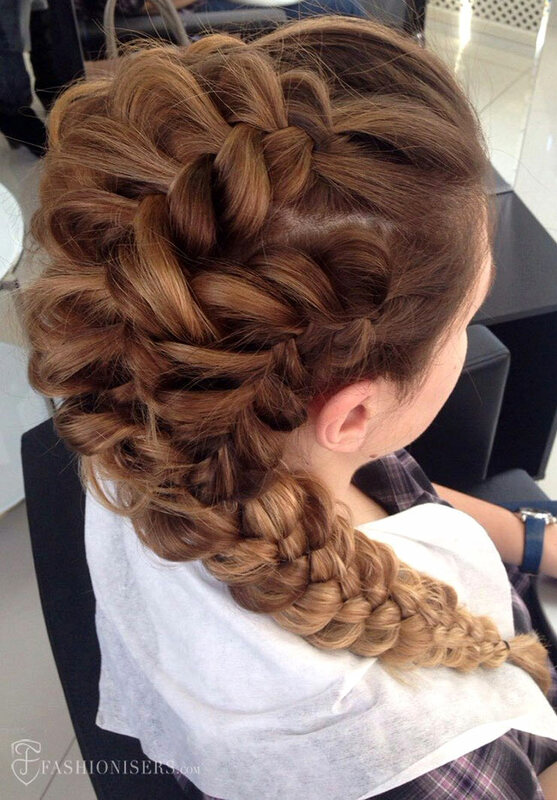 It is a romantic look really, one that speaks of innocence, while the Dutch braiding from the center of the head in triple plaits adds a fiery character to it. This makes for a rather thick plait down over the shoulder as all three combine on one side, effectively adding Prom Queen Chic to a zesty personality. It is certainly a look you will want to emulate, perhaps even more than the looks portrayed before this. We have angles and princesses, society ladies and Prom Queens; this look is all about the mermaid, complete with a fishtail design to add more of a sea creature appeal to the gorgeous hairstyle. This one is a lot more demure, showcasing more of an innocence that can be seen in the eyes of the young lady attending the prom. Using blonde hair adds a bit more dimension really, but this look works with any hue in the tresses, particularly the reds and the chestnut browns with a tinge of burnt ember in sight. Let us just hope that your siren song does not lead to chaos instead. There is something to be said about a mermaid at a prom night, for nothing could be a more compelling reason to attend. You shall be the lady whose card is always full, the one whose feet will tire from the dancing before you settle for a walk in the gardens, the moonlight sparkling through your eyes. Romantic, no?